I got a craving for Italian. Not sure where it came from, but after last weekend’s epic fail when it came to picking something J would like, I wanted to make up for it and try to find something that would interest her more than greasy bar food. We don’t do Italian very often because it can be pretty pricey. When we do splurge, I always feel great about the meal until I pay the bill. I love Italian food, I love home made pasta, and I love the large portions, but all of the things I love usually come at a price. I narrowed the choices down to two restaurants…neither of which we have been to. I left it up to J who, in turn, left it up to me. I decided to go with the one with the larger menu just because I wanted to make sure J had a couple options. 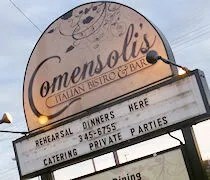 Comensoli’s Italian Bar & Bistro is on that weird corner where Main Street and Michigan Avenue meet. That weird corner makes it a little hard to get to the parking lot because Main Street is one way at that point so if you’re coming from the west like we were, it involves during a U-Turn and turning around in the old Burger King Parking lot. Since I had to work until 6:00, our dinner excursion started around 8:00. We pulled into the parking lot and got a little worried because we were the only car there. On our drive in, I noticed three waiters standing out in front. We were both wondering while a place like this was empty at 8:00 on a Saturday night. The front door actually opens into a covered patio. I didn’t notice it right away, but J noticed wedding decorations. Thinking they might be closed for a wedding, J asked an employee standing near the door. She said they were open and that the wedding had just wrapped up. That explains why the place was empty. We stepped through an open door into the main dining room where we were met by a hostess. The space is very small and intimate with a couple dozen tables tops. Most of the light is natural lighting that comes in through two big windows overlooking Main Street. Since we were the only couple in there at this point, the hostess took us to one of those tables near the windows that gets great natural light. With the menus, we were given the wine, beer, and martini list. J grabbed the wine list and I went looking for the beer but couldn’t find it on the menu we were given. I looked up at the bar and could see the orange globe with the white handle on the taps and knew they had Oberon, so that’s what I ordered. J went with a glass of wine which came in a very tiny glass. She sipped it slowly and asked for a glass of water so she would have something to drink once our meals arrived. We both started with side salads which is pretty unusual for me, but I was hungry and figured something green wouldn’t kill me. I got the Parmesan Peppercorn dressing which is pretty thick and just a bit spicy. J got a vinaigrette. 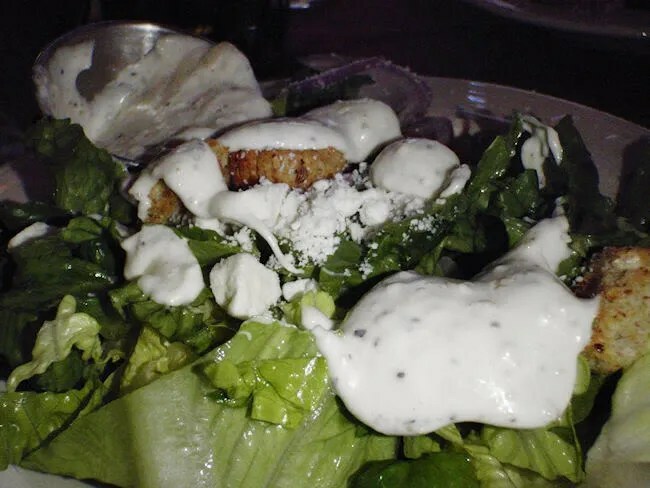 The salads were pretty simple, but also a pretty good size. Much more than the side portion I was expecting. They came with croutons, onions, and tomatoes. Nothing fancy, but a good starter. While we were eating the salads, our waitress came out with a basket of bread. It was a soft, chewy loaf that complimented the olive oil and Parmesan that was on the table already. For entree’s, I stuck with what I love in Italian cooking. The Meat Lasagna. 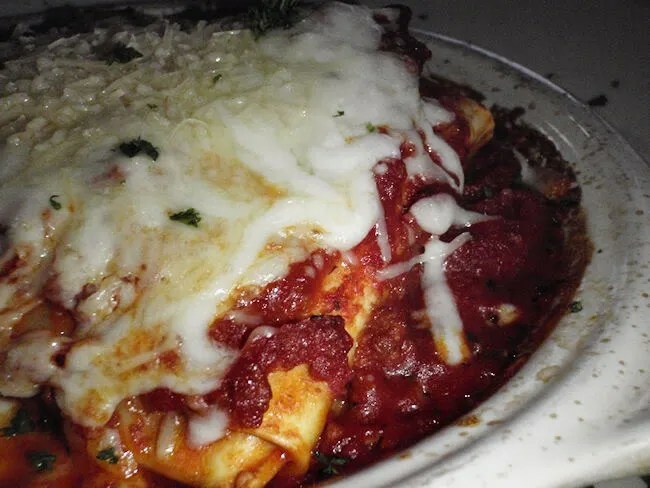 The large plate, which was still very warm from the oven when it was brought out, was layered with home made lasagna noodles, four cheeses, and meat sauce. The pasta was so tender and so cheesy. I always say it’s hard to beat my mom’s lasagna, but this one came pretty close. I don’t want to say I was struggling to finish the dish, but I it was a challenge to make sure I didn’t leave one bit of deliciousness on my plate. J also stuck pretty close to what she knows best by ordering the Cheese Ravioli. 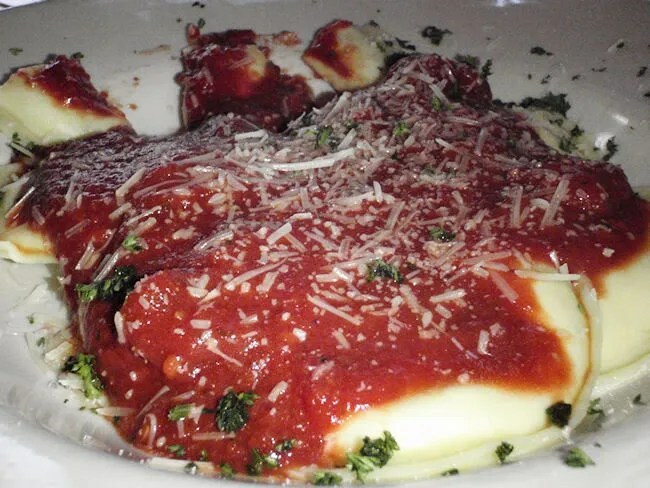 She got a large plate with large ravioli’s stuffed with three cheeses and covered in a marinara sauce. She said her plate was also delicious. She gave a couple of the ravioli’s to me because she felt bad about taking just three ravioli home. I wasn’t as big of a fan of the marinara because I really liked the meat sauce. Getting a taste of that really made me realize how robust the meat sauce was. It was still really good, but I’ll take the meat sauce. Like I figured, the bill was much higher than we usually spend on a casual night out, but that was due to adding the salads and both of us having alcohol. Before tip, the bill was $46. I’m not saying that’s outrageous. It’s about what I expected to spend when I decided I wanted Italian. It’s one of those things that it’s nice to treat ourselves to every now and then. Comensoli’s was really good. We had driven by the place many, many times, but never knew what to expect. It’s right on par with some of the best Italian in the region and as far as Italian goes, it’s definitely in the affordable category. 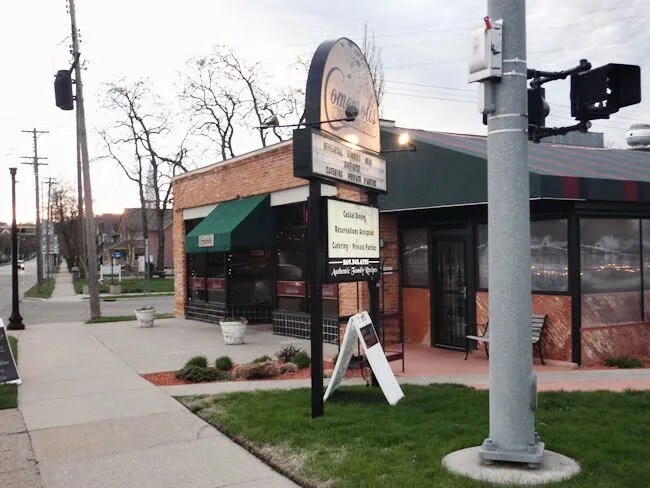 We tend to lean towards Italian for special date nights and Comensoli’s is one of those places that would fit that category really well.